Four score and several Saturdays ago, a group of friends ventured into the city and set forth to a magical land filled food options as far as the eye can see. 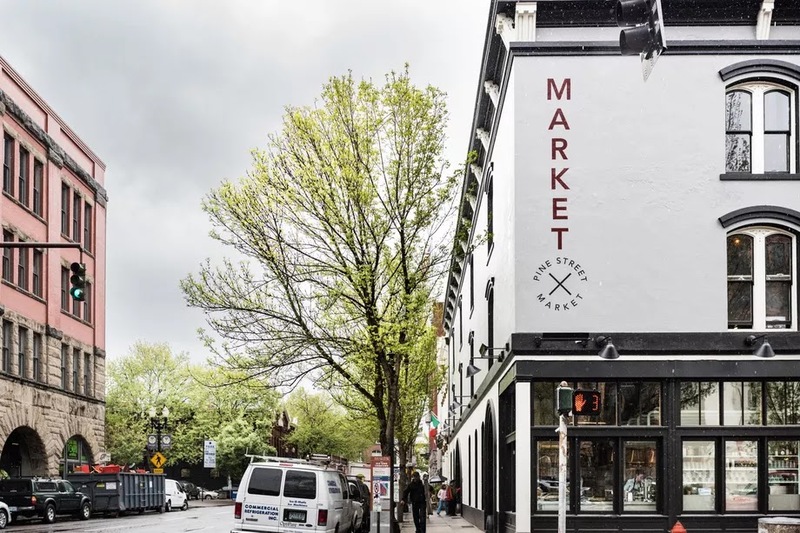 Some refer to this as a food court, Portlanders know is as Pine Street Market. Situated on the corner of Pine and 2nd, this array of Oregon eateries varies from authentic Japenese style ramen to James Beard award-winning pastries. After taking a few moments to collect myself (having this many options tends to be a tad overwhelming) I decided it's always a safe choice to start with coffee. This isn't any old cup of joe, nationally recognized Barista owner, Billy Wilson opened Brass Bar to feature their specialty roasts and teas and carefully crafted this heavenly Marzipan & Honey Latte. If I had to eat one type of cuisine for the rest of my life, it would probably be Korean so you can bet I was stoked to try a bite from Kim Jong Smokehouse which prepares Korean-style street food using Southern-style BBQ smoking techniques. While their menu is limited, their selections of proteins and sauces make it easy to customize your order and in true Southern-style, they don't skimp on portions. The Cured Salmon Bipimbap bowl with Smoked Kim Chee combines a myriad of flavors ranging from the smoky spice rub on the fish to the fermented heat of the Kim Chee and the decadent "sauce" from the runny egg yolk. Such an epic lunch had to be followed up with a legendary dessert. We happened to be here pre-eclipse weekend and Salt n' Straw's Wizbangbar was serving a special "eclipse cone" aka a crazy combination of a “black charcoal waffle cone” rimmed with edible gold, filled with spiced marshmallow fluff, golden yellow coconut, and turmeric soft serve ice cream, and topped with a black sesame shell. It even had pop rocks on top that are supposed to look like craters. Yes, it was a mouthful...literally. While I give this cone an A+ for creativity, the combo of the charcoal shell and creamy turmeric center was just a little too much for me, but it was definitely worth the one-time experience. I am so glad that I finally got to check out this unique part of Portland and I'm very much looking forward to heading back and sampling some more from these eateries. Yay! A post! Been missing you. Oh my goodness that Korean food looks amazing! Glad to see you are back on the blog. I've missed your posts!